New York Times investigative reporter Ian Urbina has lifted the lid on modern day slavery at sea in his two year, award-winning research ‘The Outlaw Ocean’. 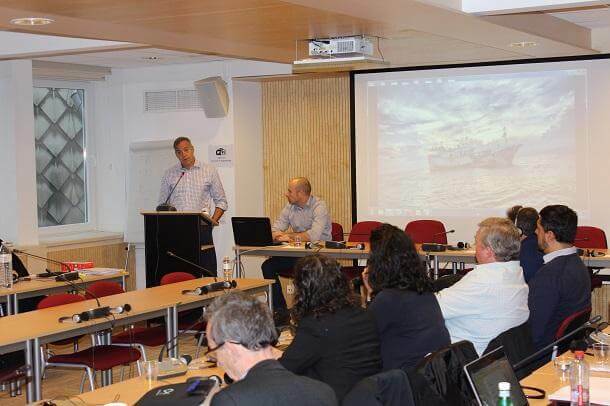 On Thursday 3 November he presented the highlights of his series of articles to the ETF, ITF and key stakeholders of the EU fishing sector disclosing practices of crime and violence in international waters that often go unpunished. On 14 October 2016 the Council of the EU has approved a Directive regulating working conditions in the fisheries sector following a long-standing request from the EU Social Partners (ETF, Europêche and Cogeca) formalised in a Social Partners’ Agreement. The Directive transposes the ILO Work in Fishing Convention 2007 (C188) into EU law with the aim to ensure better working conditions for more than 150,000 fishermen in Europe. It will only come into force once 10 ILO Member State have ratified the Convention; at present nine did so, two of which are EU countries. “There is an urgent need for the EU to take a leading role in fighting anarchistic practices at sea and pursue a more socially sustainable fishing sector at global level. The current common fisheries policy is focused on environmental protection and resources management. It is high time to start thinking about people and ensure decent working and living conditions which can pave the way for global standards for the sector”, Livia Spera continues. Ian Urbina’s presentation at the ETF premises was attended by representatives of the European Commission and Parliament, EU stakeholders (ship-owners, traders, processors), environmental, social and development NGOs, representatives of several Advisory Councils and ETF/ITF affiliates in the Fisheries Sector.